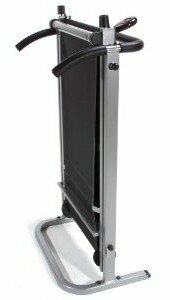 The Stamina InMotion II manual treadmill requires no motor so you can use it anywhere, anytime, and it easily folds up and can be wheeled out of the way when not in use. The battery-operated LED monitor display workout time, speed, distance, and calories burned with a one-button control. Get the Stamina InMotion II on sale now at Amazon! User reviews on the self-powered Stamina InMotion II manual treadmill have been surprisingly positive. This model features magnetic resistance and dual-weight flywheels to help the belt roll freely around the end rollers. There is a little noise when the belt is moving but it isn’t so bad that you can’t hear a TV across the room. Just remember to lubricate the deck with some treadmill lube occasionally to keep it running smoothly. The 17" x 42" tread belt with its textured non-slip surface is roomy for most users and the 8-degree and 10-degree manually adjusted incline makes it steep enough to get a heart-pumping workout. The frame is sturdy enough, but the stated “250-lb user weight limit” seems excessive. We recommend that no one weighing over 175 pounds use this machine. Assembly is quick and straightforward, and the frame folds for easy portability. At just 56 pounds and a small upright footprint of just 18" x 26", you can store it anywhere. 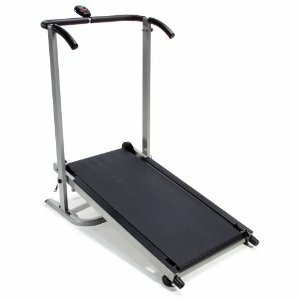 The Stamina InMotion II manual treadmill is an okay product. This is basically a good design for a manual model - to have not much more than a tread belt on rollers with some handlebars for user stability – but they should skip the monitor since it isn’t accurate for calorie counting or distance walked. 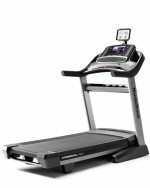 The belt will feel a bit stiff when you first start using it, and you’ll quickly find out that a manual machine takes some getting used to if you’ve been using a powered treadmill. Otherwise, if you can deal with occasionally adjusting the belt that roams from side to side, it’s an okay buy for $249.